Webberly's book and print shop is visible in the background. 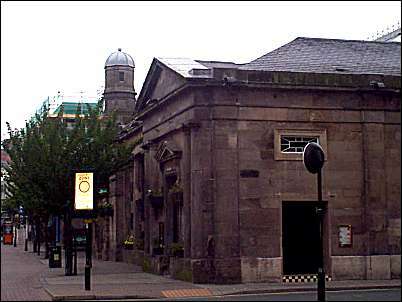 Rectangular, with facade of 5 bays, the central containing an arched entrance with a cupola above. All the side bays have Roman Doric entrances, the extreme sides being pedimented and having featured entrances with coupled columns supporting a pediment. Plain frieze; blocking course. It was from this covered market that Potteries' people drew lots for tickets to escape to a hopefully better life in the New World. 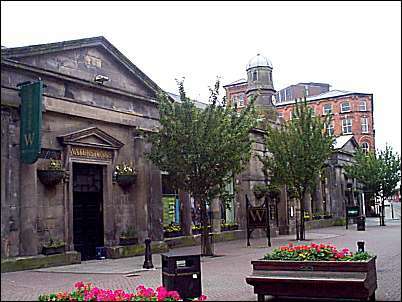 Built in 1831 as a shambles (butchers slaughterhouse), the cattle market was in nearby Lower Bethesda Street. The market closed on Saturday 14th November 1987. Three days later the stallholders were trading in the underground market of the new 'Potteries Shopping Centre' in Market Square. Tontine Street to the left, Percy Street to the right. 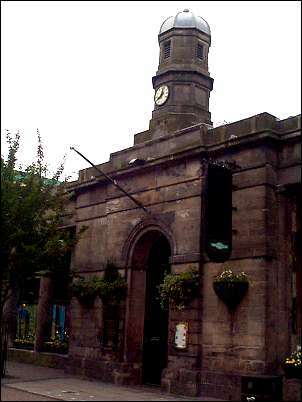 Note the Cupola, with the clock face, over the entrance.